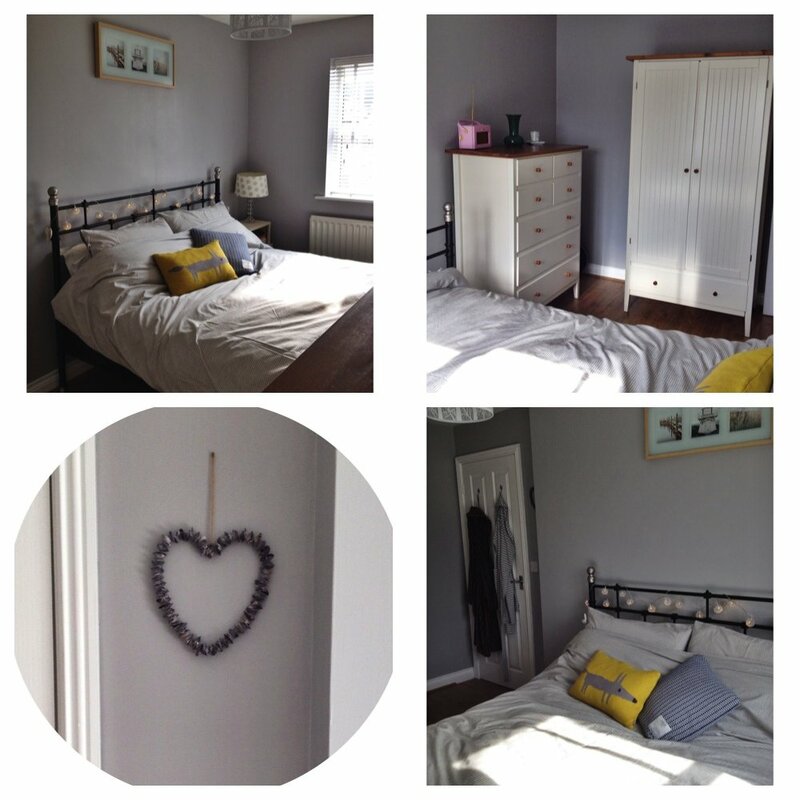 A few weeks ago I started a bedroom makeover. I’ve shared this room for the past ten years with babies, toddlers, cots and a whole host of baby related essentials. Quite frankly it was time to reclaim the bedroom! It’s been neglected and not actually decorated since we moved in ten years ago so it definitely needed showing some love! It’s not quite finished yet but here’s a mini update of what’s changed. Window – curtains have gone and been replaced by a simple white venetian blind – this totally opens up the room and lets in so much more light than the heavy curtains. Flooring – the horrible beige carpet has gone – replaced by a warm brown laminate floor – this seems to make the room feel bigger and lighter. Furniture – I replaced the bed with a king size SVELVIK from IKEA – I can’t tell you how good it feels to have a king size bed after 3 years of co-sleeping in a double bed with a toddler! I’ve moved all the furniture around and I’m really happy with the arrangement now – it makes the best of the small space. Bedding – this is John Lewis Rowan Stripe Bedding in natural it tones really nicely with the grey walls. Cushions – Scion Mr Fox Knitted Cushion in Sulphur and Croft Collection Tiny Check Stripe Cushion in Blue. 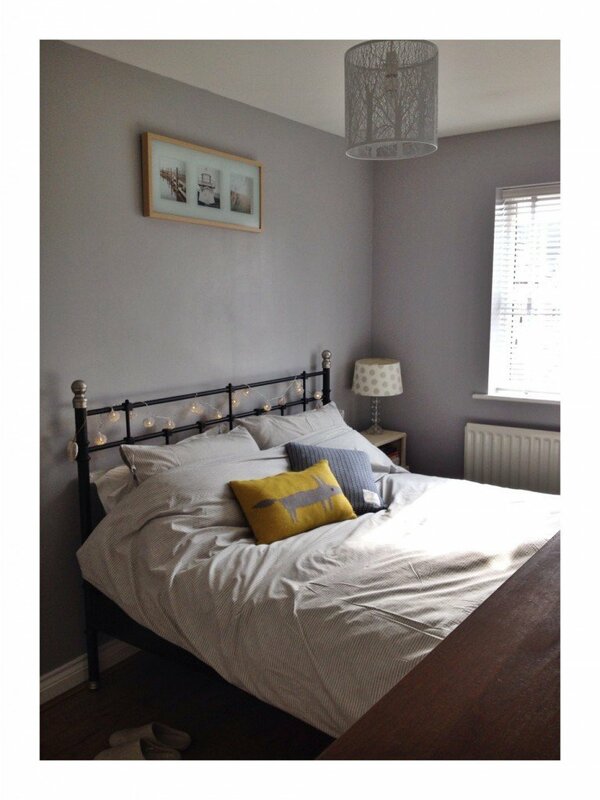 Light – John Lewis Devon Shade – this is white metal and casts gorgeous shadows on the walls. Fairy Lights – Parlane Wire Ball Garland from John Lewis – I love these they have an industrial but pretty look. Heart Decoration – Parlane Shell Heart from John Lewis – lovely little cream/grey/blue shells threaded into heart shape. So what still needs to be done? I still need to get another bedside table – I have ordered one which should be here by the end of May – a long time but it’s worth the wait – I adore it! I need a mirror which I’m hoping to find in a junk shop or reclamation yard. And I want some more pictures on the wall but these will just be found as and when. Totally! The room feels so much bigger, fresher and weirdly like sleeping in a boutique hotel! And so far I’ve managed to keep it super neat – I hoping this vibe rubs off throughout the rest of the house. Don’t forget to check back for more great family home ideas UK.